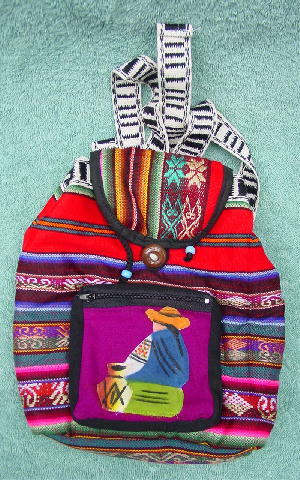 This Latin American-made fabric mini knapsack/purse has a black drawstring top closure with 2 blue beads at the ends. 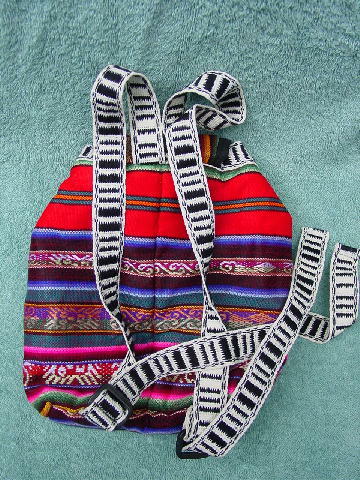 It has a top flap lid with a loop closure that slides over a brown wood button. The front has a zippered compartment. The back has two 32" black and white adjustable straps. The fabric feels like it has some padding to it. The lining is in a white fabric. It's in red, greens, blues, orange, silver, black, pinks, yellow, and white. There are geometric designs in various colors of thread.